His "Holy Trinity" icon of the Hospitality of Abraham is sometimes called the most perfectly executed of all icons. Many consider him the greatest iconographer of all time, and his "Holy Trinity" the finest icon. Very little is known of his life. He was born around 1360, and probably studied with the Byzantine iconographer Theophanes the Greek. He is known to have created icons for the Cathedral of the Annunciation in Moscow and the Cathedral of the Dormition at Vladimir. He created a highly spiritual and distinctively Russian iconographic style that set the standard for Russian iconography for centuries thereafter. 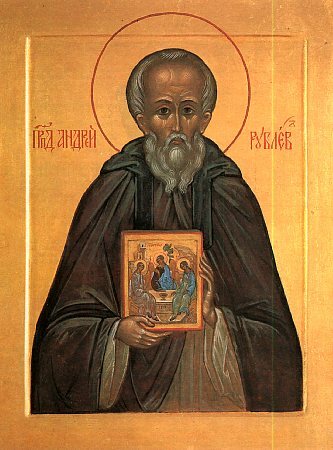 It is said that he knew St Sergius of Radonezh (July 5). In his later years he became a monk.